The roof flange sets of Freudenberg Sealing Technologies consist of a pressure ring, one or more collars and a support ring: The multi-part sealing sets are particularly well-suited for robust areas of application, such as the supply of spare parts for old systems. The roof flange sets persuade due to their long service lives. 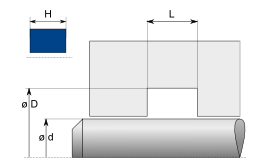 The sealing sets can be used for pistons that are pressurised on one side or on two sides – back to back.